Time spent with friends in childhood is associated with physical health in adulthood, according to data from a multi-decade study of men. 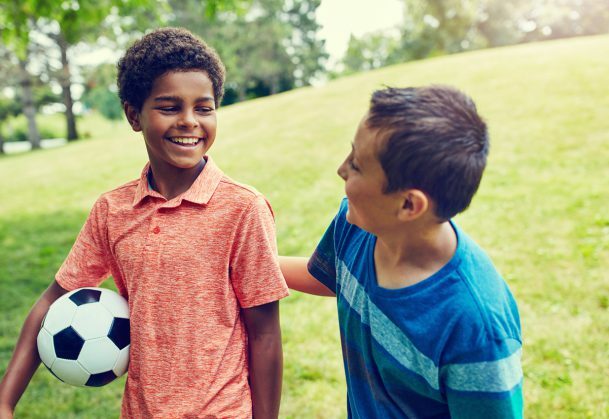 The findings, published in Psychological Science, a journal of the Association for Psychological Science, show that boys who spent more time with friends as children tended to have lower blood pressure and lower BMI as men in their early 30s. “These findings suggest that our early social lives may have a small protective influence on our physical health in adulthood, and it’s not just our caregivers or financial circumstances, but also our friends who may be health protective,” says psychological scientist Jenny Cundiff of Texas Tech University. The fact that the association was evident over a 16-year span and was not explained by several other potential factors gives Cundiff confidence in the results. “Although this wasn’t an experiment, it was a well-controlled longitudinal study in a racially diverse sample — so it provides a strong clue that being socially integrated early in life is good for our health independent of a number of other factors such as personality, weight in childhood, and the family’s social status in childhood,” she explains. In many previous studies, researchers have found an association between adults’ social well-being – including their close relationships and sources of social support – and health-related outcomes including cardiovascular risk factors. Cundiff and coauthor Karen Matthews of the University of Pittsburgh wondered whether this association might be evident much earlier in life, in childhood and adolescence. To find out, the researchers examined data from the Pittsburgh Youth Study, a longitudinal study following cohorts of boys who were initially recruited to participate as students in Pittsburgh public schools. Specifically, they examined data from 267 individuals in the youngest cohort, most of whom were Black (about 56%) or White (about 41%). The participants’ parents reported how much time their children spent with their friends during an average week, beginning when the boys were about 6 years old and continuing through age 16. The study also included data on various individual characteristics (e.g. extraversion and hostility in childhood; physical health in childhood and adulthood) and family and environmental factors (e.g., socioeconomic status in childhood, social integration in adulthood). Analyses revealed that boys who spent more time with their friends in childhood and adolescence, as reported by their parents, had healthier blood pressure and body mass index at age 32. This association held even after Cundiff and Matthews accounted for other potential influences, including physical health in childhood and social integration in adulthood. Black participants and White participants showed a similar pattern of findings over time. The study includes only one measure of social integration and does not include specific measures of physiological processes or cardiovascular function. Cundiff and Matthews note that expanding the scope of measures used in future research could help to illuminate the pathways that link early peer relationships with physical health decades later. This work was supported by National Institutes of Health Grant No. HL111802 and Grant No. HL07560.